Walter Smith III is no stranger to “Jazz in Perspective”. As a leading jazz modern tenor saxophonist, his music adds a unique perspective. 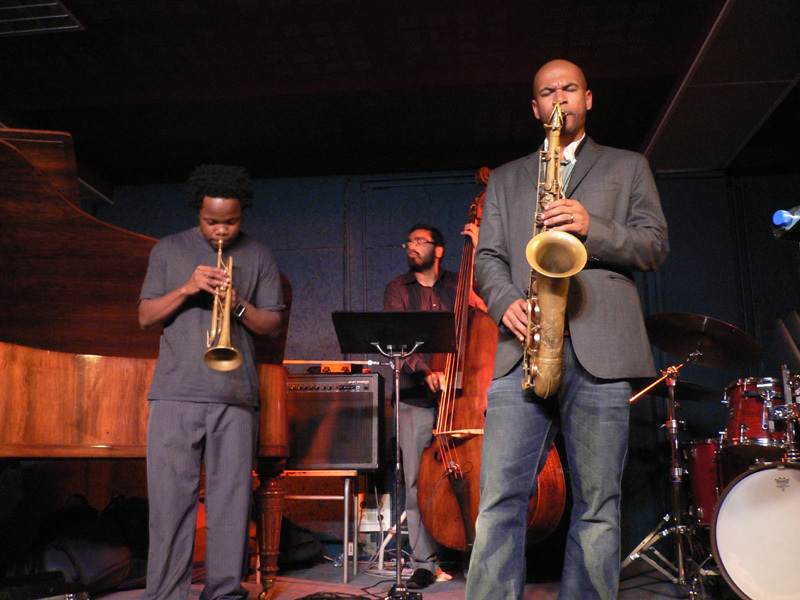 Here is the first ever “Jazz in Perspective” interview with Walter Smith III. Who are your influences as a jazz musician and how have they shaped your perspective on jazz or musical understanding? Growing up I listened to a lot of Coltrane, Wayne, Branford, Kenny Garrett, Joshua Redman, Ornette Coleman, Freddie Hubbard…the list goes on and on. For every older record (CD) I would buy, I would also get something that was current as well, so for a while my two favorite records were A Love Supreme and Noveau Swing (Donald Harrison). Then it would change to Sphere’s of Influence (Brian Lynch) and Monk Live at the Five Spot feat. Johnny Griffin the next month, etc. (on a side note I have a VERY ugly/random record collection). By bouncing around a lot with styles and eras, it led to my perspective on jazz being equally accepting/influenced by every type of approach that I encountered. For example, in high school, I can still remember practicing combining lines/approaches of Walt Weiskopf’s with Bird’s and composing a gospel tune with Robert Glasper based on a Johnny Griffin lick. Didn’t always sound great (obviously) but that kind of meshing of styles really shaped how I play today. What were your experiences at the Thelonius Monk Institute? The Monk Institute was great for a couple of reasons. I can’t put a value on Terence Blanchard’s mentorship during the two years. I learned so much about composition from him and gained so much confidence in every aspect of my musicianship. Other than that, performing with Wayne Shorter and Herbie Hancock on a couple of tours was also a truly inspiring experience. Words cannot express the level of music that was created every time those guys played. It is just amazing how they have so made so much music in their lives and still get excited to see each other and perform every night. We should all be so lucky to accomplish what they have and still have a genuine love and respect for playing music. How do you approach and arrange certain pieces like “Duke Ellington’s Sound of Love”? Sound of Love actually didn’t have an arrangement did it? I haven’t listened to that in years, but I am almost positive that it was just played trio (tenor/bass/drums). It was actually the first and only time I’ve ever played it and I’m embarrassed to say that I was reading it from a lead sheet. It was really last minute and I had just been listening to it on one of Joe Lovano’s records (quartets live @ the vanguard i think) and decided to try it. One take, but it worked out ok.
What do you think about when you compose? When I compose I am constantly trying to take one idea and expand it so that everything that I put on paper is an extension of that initial idea. At the same time I am trying to create a vibe or mood that is unique to that composition. Sometimes that leads me to think about scenery or situations from my life or movies/video games to try and achieve that feeling. It’s kind of like film scoring without an actual film.